Fischer's Lovebird Personality, Food & Care – Pet Birds by Lafeber Co. The Fischer’s lovebird has plenty of energy and can be a loyal friend if interacted with regularly. While energetic, Fischer’s tend to be gentler than other lovebird species, especially when in an aviary environment. The Fischer’s lovebird might not be as popular as the more common peach-faced lovebird but it has an equally charming personality. The Fischer’s is second in popularity to the peach-faced lovebird, but are not second in personality. The Fischer’s natural habitat is central Africa, as with the peach face, and it is quite prolific in captivity — domestically bred babies can be found easily in just about any pet shop. They can be a bit pricier than the normal peach-faced lovebird, especially the rarer mutations, which are quite popular with lovebird fanciers. Fischer’s lovebirds are native to Africa. Like most birds, lovebirds love to exercise, and require the largest cage that your budget and space can afford. Lovebirds that are cooped up in a small cage and never given any freedom tend to become neurotic and can develop self-mutilating habits. These lovebirds are reported to live between 12 and 15 or more years. Some great foods for lovebirds are Nutri-Berries and Avi-Cakes. 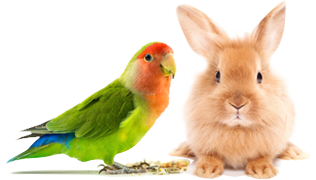 Both come in different flavors, and both offer lovebirds premium, balanced nutrition with shape, textures, and ingredients that increase food interaction. This results in nutritious foraging, and that promotes better health for birds. Lovebirds are a chatty bunch, singing and whistling all day long, and are especially vocal at dawn and dusk. They are not known for their talking ability, but their song is pleasant, more so than many other companion parrots. The more lovebirds you acquire (and it’s hard to buy just one) the noisier they will become. They are flocking birds in the wild and love to talk to one another. Fischer’s lovebirds are often available in most pet stores, as well as from bird breeders.